Thomas Sydenham, the celebrated “father of English medicine,” once said: “Among the remedies which it has pleased Almighty God to give to man to relieve his sufferings, none is so universal and so efficacious as opium” (quoted in Smith 1995). Opium, or poppy tears, is the dried latex derived from opium poppies. Opiates, defined in medicine, refer to the alkaloids naturally found in opium poppies, and opioids are the synthetic drugs that resemble opiates. Opium is a gift and curse to modern mankind for its contributions of morphine and heroin, the former being the gold standard of analgesics, and the latter a notorious and deadly recreational drug. 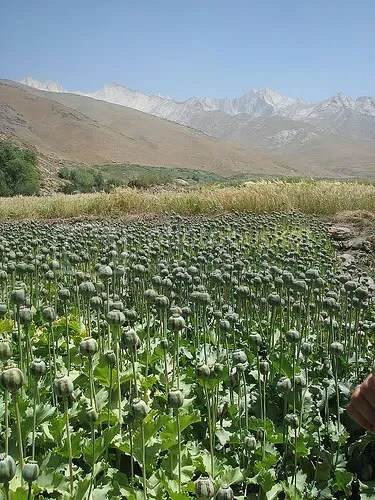 Opium’s influence throughout history stretches well beyond China’s widely noted opium wars in the 19th century, as Carbon-14 dating records it use as early as 4200 B.C. (Rudgley 1999). Overshadowed by its negative connotations, opium and its legacy prove to be a benefit to mankind for its millennia of medical use on a global scale. Over a dozen discoveries document opium from Neolithic settlements in Mediterranean nations during ancient times. At one particular site in Spain, the “Cueva de los Murciélagos” (bat cave) burial site holds large quantities of poppy seed capsules (1999). The earliest findings of opium poppy cultivation come from Mesopotamia in 3400 B.C. There, Sumerians named the plant Hul Gil, or “joy plant” (Brownstein 1993). From then on, Babylon and Egypt continued opium production, and Egypt used the plant for medicine almost 2,000 years later. The Papyrus Ebers, dating around 1550 B.C, archives medical instructions on how to “stop a crying child” by using grains of poppy-plant smashed to a pulp. Egyptians also soaked sponges in opium for surgery purposes (1993). Earth’s oldest civilizations used a medical plant that still has influence in modern medicine; mankind would not continue to use a material for so long if it did not have immeasurable advantages. Anthropologists, noting opium’s presence in mythology, speculate that priests during the ancient era might have used opium in rituals for their healing powers (1993). For example, in Egyptian mythology, Thoth holds credit for the creation of opium, while Isis allegedly used the plant on Ra to treat a headache. Egypt limited opium’s use to magicians, priests, and warriors. In Greek mythology, the gods Hypnos, Nyx, and Thanatos (deities of sleep, night, and death, respectively) often held or wore a wreath of poppies. This symbol of nocturnal oblivion also regularly adorned statues of Aphrodite, Apollo, Demeter, Isis and Pluto, among other Greek gods (Schiff 2002). Ancient civilizations held opium in high regards for its capabilities. From literature to medicine, opium embedded itself into Greek society. Hesiod is responsible for the first Greek written account of opium production in 800 B.C. Even Homer mentioned the plant in a simile; when he described to an audience a weary warrior dropping his heavy helmet-equipped head like a drooping poppy bud. Then Hippocrates advocated opium’s use for treating female diseases, internal diseases and epidemics. He, along with Pliny the Elder (natural philosopher), Pedanius Dioscorides (botanist and pharmacologist), and Scribonius Largus (court physician to Roman emperor Claudius), used the term “meconium” to refer to poppy juice derived from the leaves and fruit. Greeks also extracted the juice by boiling the plant for poppy tea and made tablets by crushing the plant in a mortar and pestle. In 330 B.C., Alexander the Great introduced opium to India and Persia (Kritikos and Papadaki 1967). The Greek empire’s acceptance of opium predetermined Western medicine’s acceptance of opium, as Western medicine takes large cues from the Hippocratic School of medicine. The Islamic Empire, praised for its great libraries and expert physicians, carried the medical use of opium into Eastern civilization. During his lifetime from 845-930 A.D., Persian physician Al-Razi used opium in anesthesia and advocated its use for treating melancholy in his work “Man la Yahduruhu Al-Tabib,” a medical manual for everyday civilian use (Jewish Virtual Library 2011). Then, Abu al-Qasim al-Zahwari used opium as a surgical anesthetic, prompting him around 1000 A.D. to write the dissertation “al-Tasrif,” upheld in medical philosophy for 500 years (Ahmed 1990). Around that time, Arab traders introduced opium to China (Schiff 2002). Lastly, another Persian physician by the Latinized name of Avicenna regarded opium as the most powerful stupefacient. Avicenna spread this declaration in his 14-volume medical encyclopedia called The Canon of Medicine, a work translated into Latin and many other languages, and held in high regards up to the 1500s (Smith 1980). Opium’s spreading reputation as the ultimate stupefying drug, of the time can be interpreted for better or worse, depending on its use. Despite subsequent recreational use in opium dens and the counteracting Inquisition and Prohibition movements, Western medicine continued to uncover opium’s positive potential. In 1527, alchemist Paracelsus invented laudanum, a tincture of opium in ethyl alcohol. One century later, Thomas Sydenham recommended laudanum for diarrhea, pain relief, and sleeplessness (Harding, Oliver and Jokic 2000). Opium became normative in medicine, and remained that way entering the 1800s. During the American Civil War the Union Army used around half a million opium pills and 2.8 million ounces of laudanum powder (Schiff 2002). In spite of opium’s addictive nature, there was no better substitute at the time, and its pill and powder forms made it easy to distribute to the needy masses. The rest of the 19th century brought the transition from opium to opioids with gradually stronger effects. The four main alkaloids found in opium are morphine, codeine, thebaine and papaverine. In 1817, Friedrich Sertürner published his success at isolating pure morphine from opium after 13 years of research and one notable, nearly catastrophic trial on himself and three young men. Morphine marked the first instance of a pharmaceutical isolated from a natural product (Huxtable and Schwarz 2001). Medical professionals often used purified morphine as an analgesic, especially after the creation of the hypodermic syringe in 1853 (Nicolaou and Montagnon 2008). During the use of morphine, other individuals discovered the rest of the opioids: Robiquet isolated codeine in 1832, Thoboumery and Pelletier identified thebaine in 1835, and Merck extracted papaverine in 1848 (Booth 1996). Successful isolations of these opiates paved the way for the coming opioids as chemists experimented with these alkaloids to make improved compounds. In 1874, after experimenting with morphine, British scientist C. R. Alder Wright synthesized the earliest opiate called diacetylmorphine, now known more commonly as heroin. Felix Hoffman rediscovered the drug while working at the Bayer pharmaceutical company in Germany. Bayer erroneously marketed heroin as a non-addictive substitute. In 1900, the Eli Lilly pharmaceutical company began selling heroin over the counter in the United States and marketed the drug as a treatment for cough and flu alongside Aspirin. In World War I, doctors administered heroin intravenously to fatally wounded and anguished soldiers on a normal basis. By the 1920s, heroin’s risks outweighed its advantages, and clinicians pushed for the drug’s recall. Today, heroin prescriptions are still available in some countries like Great Britain, where they remarket the product as diamorphine and use it as an analgesic. Heroin tops the list of illegal drugs, but it has proved to be a significantly valuable analgesic (Nicolaou and Montagnon 2008). Also, heroin’s success and failure instigated the search for non-addictive opioids in smaller and eventually larger potencies. Pushed by the needs of World War II in 1939, Otto Eisleb under the I. G. Farbenindustrie pharmaceutical company in Germany discovered dolantin, a painkiller less potent than morphine and better known by the name meperidine. By 1944, thanks to war’s positive influence on the research of new medicines, manufacturers produced 1,600 kilograms of meperidine annually. Outside of war, medical professionals used meperidine as an analgesic after operation or during childbirth, but the drug currently faces a decline in use because of unwanted side effects (2008). Meperidine is best in short-term care, because the drug needs to be prescribed in larger amounts after each subsequent use to achieve the same effect. For I. G. Farbenindustrie, the discovery of dolantin served as a template for newer compounds. Max Bockmuhl and Gustav Ehrhart, close colleagues of Eisleb, filed a patent in 1941 for the discovery of polamidon, now known as methadone. After the war, Eli Lilly commercialized the new drug. Methadone is almost as potent as morphine, but also very addictive and rather toxic. Today, many countries use methadone as a prescribed replacement for heroin, all in part of a proposed recovery program for heroin addicts, with the goal of weaning people off opiates altogether in due time (2008). For example, in the United States, many VA hospitals have clinics dedicated solely to methadone and the rehabilitation of heroin addicts. As clinicians developed newer opioids over time, opium’s legacy soon found a lasting role in veterinary medicine. In the 1960s, Professor Bentley’s team working on thebaine in Edinburgh accidentally synthesized etorphine. Apparently, somebody accidentally stirred cups of tea with a contaminated glass rod, and within minutes several scientists were knocked out cold on the floor. The drug in their tea also goes by the names of M99 or Immobilon, reportedly 3,000 times as potent as morphine. Less than 2ml of the substance can take out a rhino, and a simple scratch from a tainted needle can kill a human. Luckily, an antidote called M50/50 or Revivon is readily available (1998). Thanks to etorphine, Doctors of Veterinary Medicine can perform surgery on elephants if necessary. In conclusion, despite the addictive nature of opium and several derivatives, history supports opium and its medical contributions to humankind on an international scale. Mesopotamian, Babylonian, Egyptian, Greek and Islamic Empires openly recognized and tested opium’s potential. Many notable figures in the history of medicine worked with opium and opiates, including Hippocrates, Abu al-Qasim al-Zahrawi and Thomas Sydenham. War gave opioids an everlasting role, with the use of opium tinctures and powders in the American Civil War, heroin in World War I and meperidine in World War II. To this day, no drug has been discovered that equals the analgesic effect of opium without also replicating most of its addictive tendencies. Until such a time, we cannot help but agree with Sir William Osler’s claim that opium is ‘God’s Own Medicine’ (Booth 2008). Ahmed, M. (1990). El Zahrawi [Online]. Available from: http://www.ummah.com/history/scholars/el_zahrawi [Accessed 12 January 2011]. Booth, M. (1996). Opium: A History. New York: St. Martin’s Press. Brownstein, M. J. (1993). A brief history of opiates, opioid peptides, and opioid receptors. Proc Natl Acad Sci U.S.A. [Online], 90(12), 5391-5393. Available from: http://www.ncbi.nlm.nih.gov/pmc/articles/PMC46725 [Accessed 10 January 2011]. Harding, S., Oliver, L. A. and Jokic, O. (2000). Victorians and Laudanum [Online]. Available from: http://drugs.uta.edu/laudanum.html [Accessed 13 January 2011]. Huxtable, R. J. and Schwarz, S. K. W. (2001). The Isolation of Morphine – First Principles in Science and Ethics. Molecular Interventions [Online], 1(4), 189-191. Available from: http://molinterv.aspetjournals.org/content/1/4/189 [Accessed 13 January 2011]. Jewish Virtual Library (2011). Abu Bakr Muhammad ibn Zakariya al-Razi [Online]. Available from: http://www.jewishvirtuallibrary.org/jsource/biography/Razi.html [Accessed 12 January 2011]. Kritikos, P. G. and Papadaki, S. P. (1967). The history of the poppy and of opium and their	expansion in antiquity in the eastern Mediterranean area. Journal of the Archaeological Society of Athens [Online], 17-38. Available from: http://www.poppies.org/news/99502023966018.shtml [Accessed 12 January 2011]. Nicolau, K. C. and Montagnon, T. (2008). Molecules That Changed the World. Germany: Wiley-VCH. Rudgley, R. (1999). The Lost Civilizations of the Stone Age. [Online]. New York, NY: Free Press. Available from: http://books.google.com/books?id=vhSHnB89A0C&lpg=PA138 [Accessed 9 January 2011]. Schiff, P. L. (2002). Opium and its alkaloids. American Journal of Pharmaceutical Education [Online], 56, 186-194. Available from: http://www.ajpe.org/legacy/pdfs/aj660217.pdf [Accessed 11 January 2011]. Smith, R. D. (1980). Avicenna and the Canon of Medicine: a millennial tribute. Western Journal of Medicine [Online], 133(4), 367-370. Available from: http://www.ncbi.nlm.nih.gov/sites/ppmc/articles/PMC1272342 [Accessed 12 January 2011]. Smith, R. (1995). The war on drugs. British Medical Journal [Online], 311(7021), 1655. Available from: http://www.bmj.com/content/311/7021/1655 [Accessed 13 January 2011].